I crochet all the time. When I get together with friends, I usually either bring along a little project to work on, or I’ll bring a small crocheted hostess gift along. Because of this, many of my friends have at one time or another asked me to teach them to crochet. Now when people learn to crochet, naturally they want to actually make something, not just practice making stitches. This, what I call my Easiest Crochet Project Ever is the first project I use when I teach crochet. This pattern has a lot of good stuff going for it. Besides being technically simple, it’s a super pattern for scrap yarn, especially all the yarns that aren’t so intuitive for other projects (Rainbow eyelash yarn that I just couldn’t resist? Yes! The ten skeins of fuzzy blue Fun Fur yarn that I got for a buck? Yes! All those variegated yarns that looked so beautiful on the shelves of the store that I brought home only to have no idea what to use them for? Yes!) The only real requirement is that the yarn is all relatively the same weight. I have a basket for all my aforementioned yarn scraps, and when I’m done with a project or when I know a yarn will sit on a shelf for an eternity to come without being used, I’ll throw it in there. 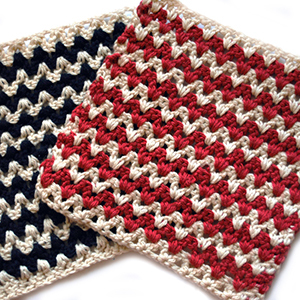 Then, from time to time, I’ll get motivated and crochet a few rows onto this scrap-ghan. My version of this blanket is huge. I originally made it to fit over and down the sides of a king-sized bed (which I don’t even have anymore), but whenever it is finished, it will be big and snuggly nonetheless. The pattern below makes a much smaller version, about 5’ across or so, but you can vary it to any size you like. 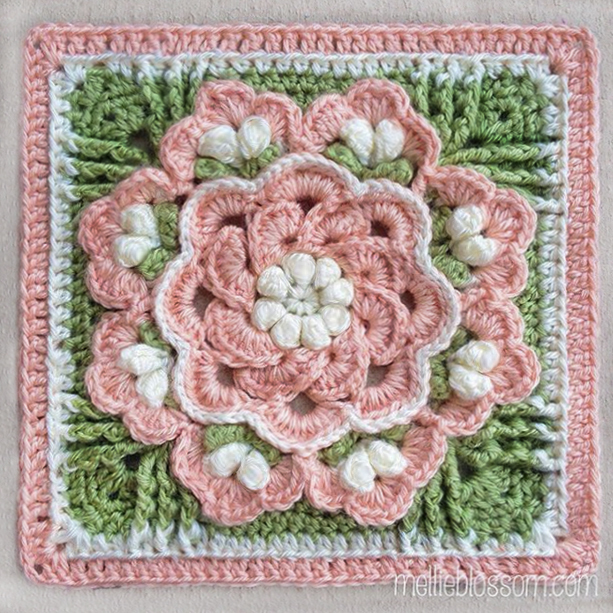 This is a typical stitch used in many granny squares. The best thing about making a scrap-ghan like this is that you don’t have to worry about when or where you’re going to run out of your color. Just tie it off and add the next color, even if it’s right in the middle of a row. All the fancy, furry yarns look great in this, and the more colorful, the better. This is really a no-rules kind of blanket, which is why it’s so great for beginners. Usually when you crochet, you want to avoid making any kinds of knots at all, gently weaving the yarn back and forth securely. I don’t do that with this blanket. Instead I just tie a good solid knot when I run out of yarn, leaving a small tail to tighten in case it ever comes loose. I probably won’t even weave these ends in either. I like the raggedy look of little pieces of yarn hanging out. You can choose to do either. Start by chaining 250. (You can make this smaller or larger as you desire, but keep it so that it’s divisible by 2 – so, an even number. ) At the end, make 3 extra chains. Turn. Row 1: in the 4th loop from your hook (so, skipping the 3 extra chains), make 1 dc. Skip the next stitch, and make 2 dc in the following one. Repeat across until you get to the end. There should be one stitch leftover. Make 1 dc in that. Chain 3. Turn. Row 2: In the space (not the stitch) between the groups of 2 dc in the row below, make 2 more dc. Repeat this all the way across. When you get to the last stitch, make 1 dc into the top chain. Chain 3 more, and turn. Row 3 – end: Repeat row 2. Make as large as you would like. When you’re done, weave in ends (or don’t) and enjoy snuggling up or giving away your brand new blanket. See, it’s easy to crochet! Oh gosh I just love this! I’m not a crocheter, but you’ve inspired me to try. I’m so glad! Let me know how it works out for you! Thanks these are good clear directions. I might try this weekend to make something! I’ve been looking for a super easy project for my 9year old and I think I found it! Her little sister will be a year in March and she wants to make her a blanket. Thanks! thank you! And do let me know how it turns out. I love this. I will get started on it right now. This was just the inspiration I needed. Thank you so much. I read this, and love the idea. I’m a yarn hoarder and have a stash of leftovers of yarn that wont fit any other project than such as this. I also hate to weave in ends, and if I can get away with it, I won’t! I found a way to join yarn together, and it wont come undone, and it looks flawless in the knitted or crochet ‘what ever you make’ item. It is called a Russian join. I love this. Its very simple and a scrap yarn buster. I also love the colors ending wherever. I use the regular old fashion knot. No weaving, and I crochet over it. All my projects turn out great using the knot method. I’ve just started on mine and I already love it. I have a giant mess of yarn thanks to my cat that I thought would be unusable for anything except for stuffing (No way i could untangle it all) but this project is perfect for it! I just tug out bits of yarn and cut them into pieces to use. I haven’t weaved in the edges but I’ve been using a smaller crochet hook to tug them through the stitches to the back. Easier then weaving it all in when you like the look of a fairly neat front. (And you can always switch the blanket around if you like the look of the tails everywhere) Thanks for this pattern! Saw you tropical delight square on Pinterest . Where can I gat the pattern? It’s gorgeous! I love this! Quick question. For the second and subsequent rows do I do all 2 dc across or do I alternate 1 dc and 2 dc like I did on the first row. Through the entire dishcloth, for every dc, you sc into it; and for every sc, you dc into it. hth!